I'm hardly ever disappointed by Entangled Teen, and Breaking the Rules of Revenge was another good example of how cute their contemporary romance titles can be. A fan of everything twin-related and the hate to love trope, I was immediately drawn to the premise. 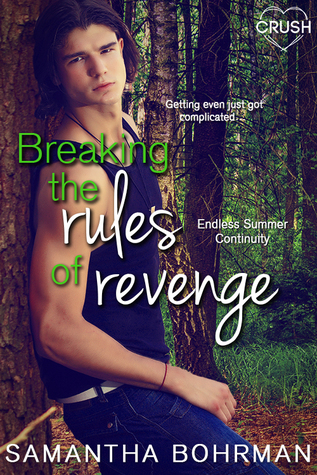 In Breaking the Rules of Revenge, we have Mallory and Blake, twin sisters who swap roles so invisible Mallory can fulfill her wish to be popular Blake for a few weeks, while her sister gets away from going to summer camp. One of the things I liked about this story was the twin's relationship. It wasn't the cliché I sorted of expected it to be. Blake and Mallory weren't the typical inseparable, best friend's forever twins. Neither were they enemies. While it became clear early on that Blake was the selfish person who was used to getting her way and having people follow her lead, she wasn't portrayed as a villain. It would've been easy to make her this super nasty person who bullied her bookworm sister, but I didn't get that vibe from the story. What I got were two flawed teen sisters. Since this is told from Mallory's POV, we get to see her grow a lot more than her twin, although Blake gets to redeem herself a little in the end. For Mallory, acting as her sister provided her the opportunity to find herself. I liked how she slowly grew comfortable in her own skin, and even though the romance was a big part of the plot, I still didn't feel like she came to accept herself because of someone else (a boy). I think it had more to do with the fact that she realized being her sister wasn't as easy or perfect as she thought it would be. As to the romance, I liked Mallory and Ben together, but I almost wished there had been a little more drama. With the hate to love thing going on initially, all the pranks and the secret Mallory was keeping, I expected a little more angst than I got. They were cute and sweet together, but I still expected more chemistry. I also wish we would've seen a little more of Zoe and George, because I loved how they were such good friends to both Ben and Mallory. Overall, this proved that whenever I'm in a mood for some teen romance I can count on Entangled Teen Crush to give me something quick and sweet.